Newly released e-mails show the former governor's foundation quietly promoted his corporate partners, including a company he's invested in. A public interest group has released the results of a multi-state Freedom of Information Act request concerning the lobbying efforts by the Foundation for Excellence in Education (FEE), the nonprofit led by Jeb Bush. The e-mails confirm previous reporting showing that Bush’s policies are designed to benefit businesses seeking to privatize public education—particularly the companies that finance Bush's nonprofit. What's new in this release, however, is the revelation that Bush could be using his education reform crusade for personal gain. In one e-mail from last year, Bush's top aide at his foundation, Patricia Levesque, communicated with school officials to urge them to use a company called SendHub, a start-up that uses cloud computing and text messages. Bush, according to TechCrunch, has a modest "five-figure" investment in SendHub. Garrett Johnson, the founder of SendHub, previously worked for Bush and still serves on the board of Foundation for Florida's Future, another Bush-run education nonprofit. In November of 2011, I published my first investigation with The Nation and The Nation Institute concerning the rush of for-profit education technology companies to enact radical “virtual schools” across the country. In the reporting, we uncovered that many individuals associated with the education reform universe—even those ostensibly leading major philanthropic foundations—are closely tied to the for-profit interests who stand to gain from these policies. Levesque, we reported, was quietly receiving funds directly from for-profit education tech companies while also serving as the executive director of Bush’s nonprofit. — In New Mexico, FEE acted as a broker to organize meetings between their corporate donors and individual Chiefs [for Change]. — Maine moved the FEE policy agenda through legislation and executive order that would remove barriers to online education and in some cases would require online classes—including eliminating class size caps and student-teacher ratios, allowing public dollars to flow to online schools and classes, eliminate ability of local school districts to limit access to virtual schools. — In Florida, FEE helped write legislation that would increase the use of a proprietary test (FCAT) under contract to Pearson, an FEE donor. 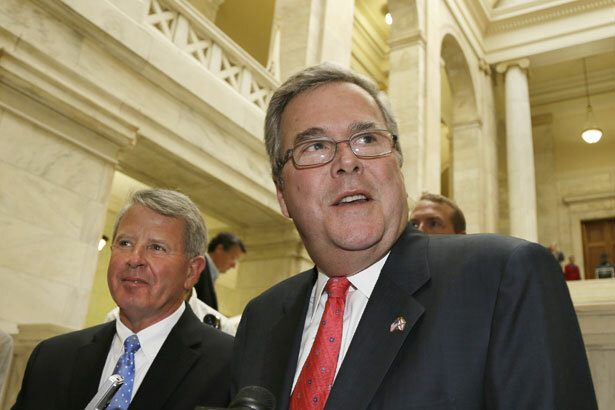 The simmering scandal with Jeb Bush's nonprofit recalls a similar scandal with his brother, Neil Bush, who led Ignite! Learning, a company the Los Angeles Times found profiting from No Child Left Behind policies enacted by President George W. Bush. While the education tech industry has enjoyed a recent surge thanks to the policies enacted by Jeb Bush and his allies, there's growing evidence that these privatized, proprietary charter schools are under-performing. One of the biggest beneficiaries of the virtual charter school policies peddled by FEE, the publicly-traded online charter school management company K12 Inc., has been cited in several studies for its abysmal performance. A report last year found that K12 Inc.'s students score between 14 and 36 percent lower than their non-cyber school peers. Only 27.7 percent reported meeting Adequate Yearly Progress standards in the 2011 school year, which the National Education Policy Center notes compares poorly to the 52 percent average scored by brick-and-mortar schools. There is perhaps no better week for these e-mails to emerge. This week is "School Choice Week," a public relations blitz designed by Jeb Bush and Frank Luntz to drum up support for school privatization and teacher union-busting laws. Rather than a movement to support children, the e-mails show that many of these reforms are also about padding the profits of companies like Charter Schools USA, K12 Inc., Pearsons and Jeb's SendHub. Lee Fang last wrote about gun companies rallying customers to fight reform.